Claudia Klein (CHT), owner and instructor of SAIH and the Mastermind Training Centres, has been taught by Roy Hunter and is the first, one of only six in the world, to bring professional training of this complex hypnotherapy technique to the African continent. 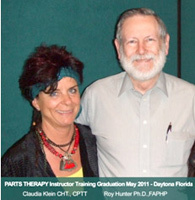 Certified Parts Therapy Facilitators (CPTF) have a high success rate in helping clients resolve inner conflict/s. As Roy describes, "It is based on the concept that we all wear different 'hats' throughout life. In effect, a part of the total personality becomes more expressive during certain times, such as when we perform certain tasks. Hypnotherapy can allow internal dialogue with ourselves while wearing these various hats." "In 1952, Federn described Freud's ego states, id, ego and superego, as resembling separate personalities much like the multiple personalities illustrated in the celebrated case of The Three Faces of Eve, but differing in that no one of them exists without the awareness of the others. I find, however, that in many cases different parts take complete control while the total individual is in a trance state of which she is unaware. A bulimic will experience time distortion while bingeing, eating for over an hour and believing that only five minutes have elapsed... Both personalities know that the other exists, but the first is unaware of the other's existence during the period of the deviant behavior." Charles Tebbetts described the various aspects of our personalities as ego parts. In some cases these parts may be physical as well as mental, and in the hypnotic state, one may actually call out these various parts and facilitate dialogue. Tebbetts continued to explain that a well-adjusted person is one in whom the personality parts are well integrated, while a maladjusted person is one in whom they are fragmented, and internal conflict exists. Claudia Klein teaches her students how to use Parts Therapy to facilitate a process where the client is able to communicate their unconscious inner conflict/s to both the therapist and the client's conscious mind, expressing its purpose, and through the use of reflective questioning (responding to the "W" questions: who, what, when, why) to gain understanding of the background of their problems, to release them, and to facilitate relearning. All students receive a Certificate of Attendance but also have the opportunity to qualify as a CERTIFIED PARTS THERAPY FACILITATOR (CPTF) and to gain certification* through the Charles Tebbett Foundation based in the USA. This allows you to be added to the FIND A THERAPIST section and to practice within the scope of your extensive education before continuing with the final courses and requirements for the Certified Hypnotherapist non medical (CHT) certification. 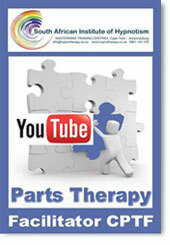 Why Is Parts Therapy Valuable? Appropriate use of parts therapy can help conflicting parts to achieve resolution. The process is much like conflict resolution, except that the client is role-playing a dialogue with his/her various parts in order to facilitate inner change. This process must be handled appropriately, as it is extremely important that such dialogue between the parts be client-centered rather than therapist-centered. Competent, client-centered parts therapy can help achieve three important hypnotherapy goals: (1) discovering background of problems, (2) facilitating release, and (3) subconscious relearning. Linda, a smoker, failed to respond to my usual benefits approach. One part of her wanted to live long and prosper, while another part felt compelled to make a statement of rebellion against a society which is manipulating her into quitting. She decided that it was time for her to make her own decisions instead of being ruled by other people's prejudices against smokers. Ron, an overweight client who was self-employed, had an inner child that felt he was working too hard, so excess junk food was his only pleasure. Ron's inner child refused to give up evening snacks until Ron agreed to balance his life. Taking more time for personal fun and recreation was the solution. Randy was a Hypnotherapist who felt unworthy to be in this profession. His perfectionist part felt nothing was good enough unless it was done perfectly. He had to learn to forgive himself for not being perfect. This part learned to be professional instead of perfect, and that his best on one day might be better than his best on another day. One of the most profound examples of a success is a former epileptic whom I know personally. He experienced two sessions with Charles Tebbetts in the late 1980's. This person overcame both drinking and epilepsy. So dramatic are the results that I've devoted an entire chapter to his story in The Art of Hypnotherapy. Roy was inducted into the International Hypnosis Hall of Fame in April of 2000 for his written contributions to the field of hypnotherapy. His parts therapy text, Hypnosis for Inner Conflict Resolution: Introducing Parts Therapy (Crown House Publishing, 2005), has received raving reviews.